A robber fly (Efferia sp., Asilidae) preys on a distant cousin (possible flesh fly, family Sarcophagidae). Not all hugs are equal, and some are stolen. I just snuck this female robber fly’s ovipositor into the frame (it’s not a stinger! ), just like I just snuck this post into Wednesday. 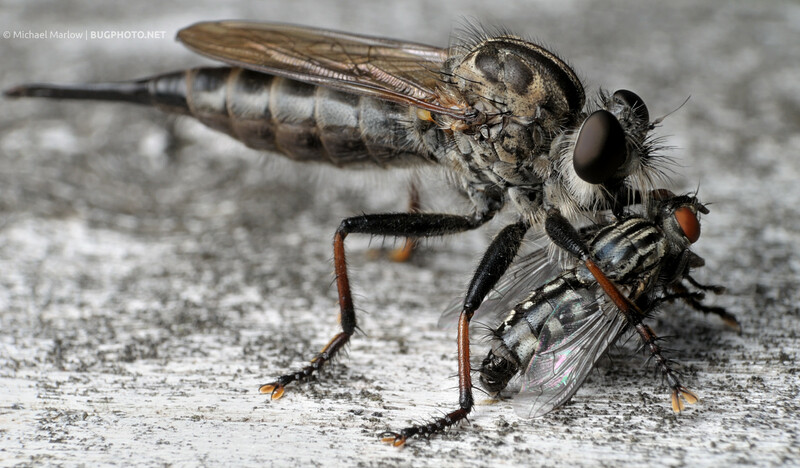 Posted in Robber FliesTagged Asilidae, Efferia, flesh fly, grey, Macro Photography, predator and prey, robber fly, Sarcophagidae, stabbed in the backBookmark the permalink. Nice capture. Both of you.